I was corresponding with my friend, Selena, this morning who mentioned that she was blogging with child on lap. I know many of you do the same, so here’s a little fun for the patient co-blogger pulled from an 19th century children’s book. Enjoy! Click to enlarge. Print this out in black and white to color: Free PDF file HERE! That is lovely & just begging to be coloured in by little hands! This is so cute! I remember looking for hidden pictures in my Hi-Lights magazine when I was little. Brings back memories. Thanks for this, we've spent a happy 15 mins playing eye-spy, but then too busy playing to blog! Thanks for the idea, make do mum! I added a link to print it out for coloring!! It is grade one all over again. I love puzzles. Hi Cathe–I thought I clicked on the wrong blog when I saw your new profile photo!! Did you just decide to cut and go dark, or is that an old photo? Either way, you look great, and I cannot miss reading your blog daily! I love that, thank you Cathe. WANT TO THANK YOU FOR ALWAYS BEING SOOOOOOOOO GENEROUS! ALTHOUGH I NEVER ACTUALLY USED YOUR PRINTS I THINK IT IS PRETTY AMAZING THAT YOU SHARE THEM !!! As I was reading your post, my 9yr old was reading over my shoulder (she's home sick today and VERY bored!). She's requested an immediate print out of the game. Thanks! thanks! I'm sure my preschooler will enjoy this. Thank you so much for sharing this ..I have my heart to it already..a lots of project with them too. Thank you! This blog post will be advertised on CraftCrave in the Printables category today (look for timestamp: [20 Feb 01:00pm GMT]). Thanks! My daughter will love this. I'm going to keep a copy in my purse for when we're out and about. Thanks a bunch perfect for those dr. visit waits. Pingback: Zoekplaatje | Gespot voor jou! Thanks so much for this download. Is this available to make into a poster for use in a public library? Love your designs. Thank you for providing us with so many vintage inspired works. I enjoyed it and my kids and patients will loved it too.Thanks. When my grandson was little he loved the I Spy Books. I am going to make him a Christmas card with this. Thank you!!! 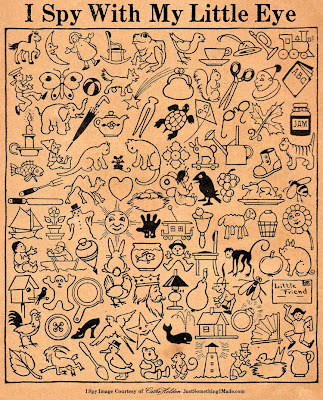 Is there any way to download & print the I Spy page without going to facebook? Fantastic on IWB for Phoneme Awareness. Thanks so much for sharing this great idea. You have awesome ideas and designs. I look forward to seeing more of your arts and crafts. Thanks for sharing. More, we want more! Great activity for Kindergarten kids. I say, “Find a word that begins with B”. They loved it! Thanks! Thank you for this great activity. I will use it for my students who are deaf and hard of hearing speech targets! Thank you! THIS Selena (not the aforementioned Selena) is preparing busy bags for a toddler and a preschooler. We’re planning a visit with Grandma and Grandpa for Thanksgiving (and a 7 hour car ride) and I want to take some fun and educational items with me. This is darling! I teach preschool and this would be perfect for learning to see a particular thing. I love this sheet. Thanks for sharing it! I would laminate and use with dry erase markers so could be used many times. Enjoy your work, very helpful.